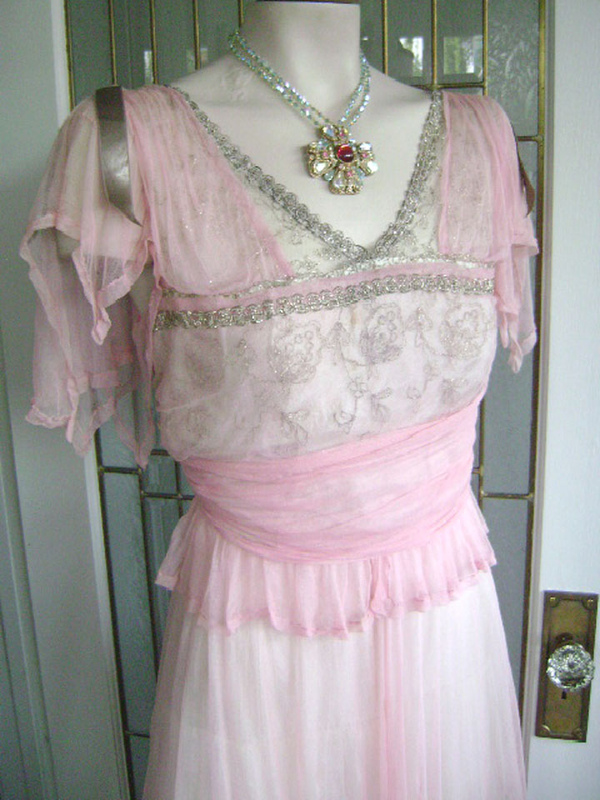 QUEEN OF THE FAIRIES ENCHANTS you with this Titanic gown from the Edwardian era. 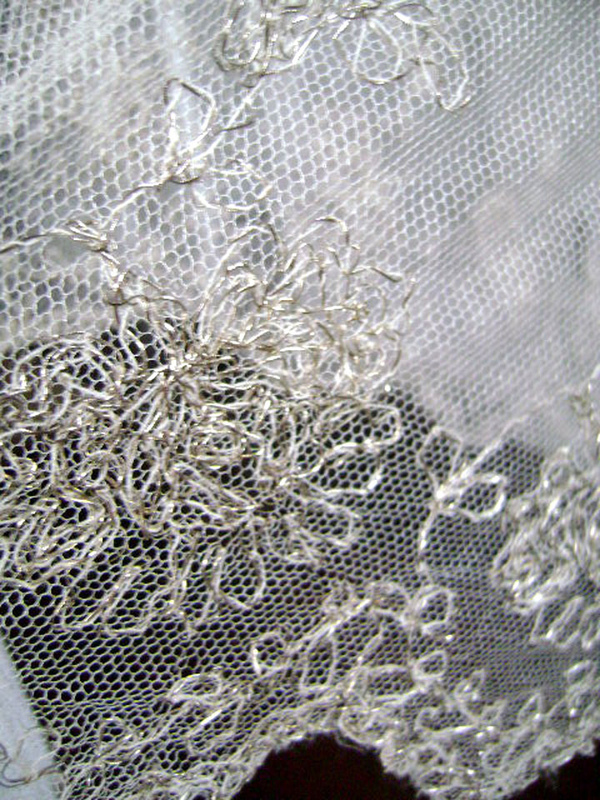 It is a gossamer confection of net and metallic lace over a satin underdress. There are many layers to this, and I have taken many photos so keep scrolling down. The main underbodice is a cotton net, covered with a swath of white satin, a rayon satin, so it is not deteriorated like silk would be, this dress is strong. 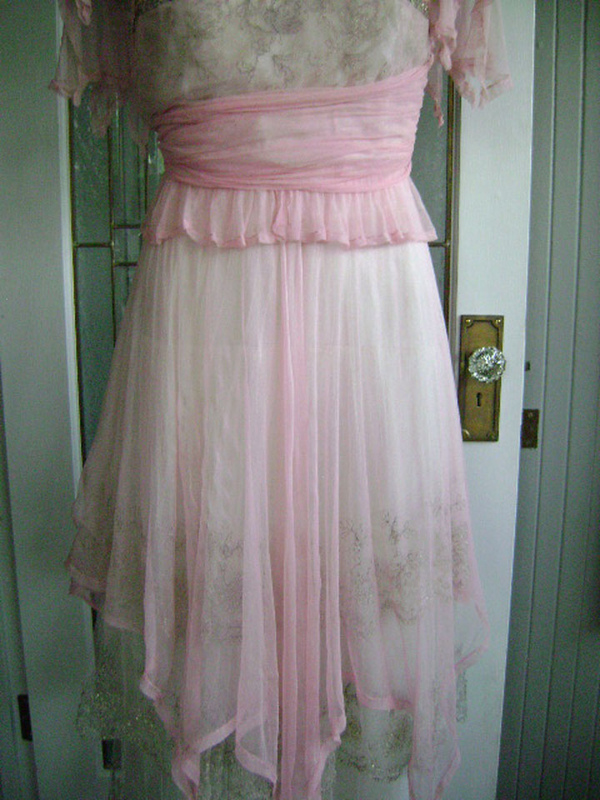 The main underskirt is also this white satin. Over the satin, both on bodice and skirt is layers of rayon net which has a design of Metallic Silver threads woven into it. The skirt is three layers of this, tiered, each layer longer than the next as you can see. 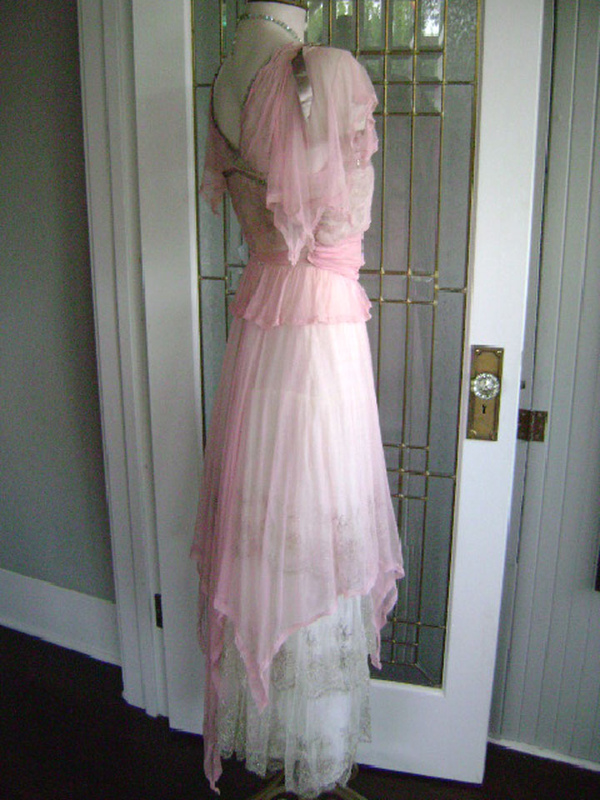 Over this is pink rayon gauze, hanging in long tails and tendrils, just a wonderful skirt. 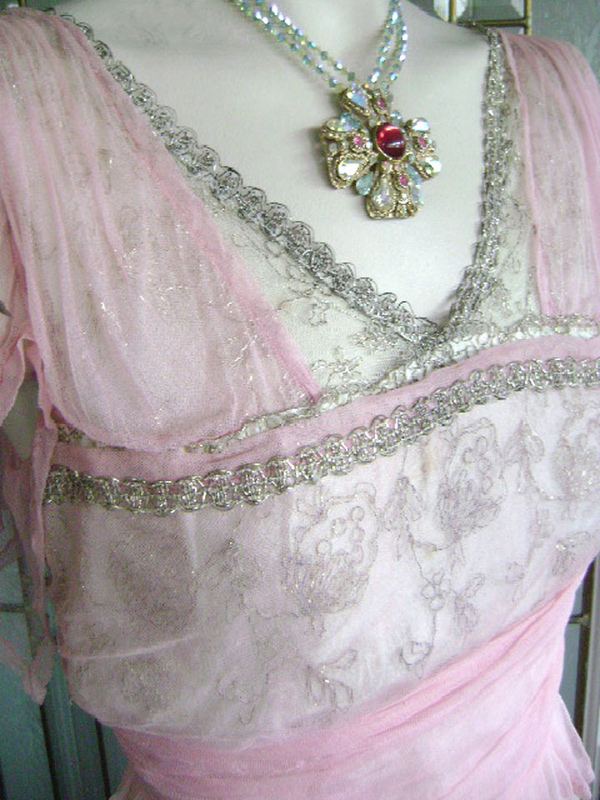 The same pink gauze forms the trailing sleeves and covers the bodice, so that the silver metallic net shows from under it. 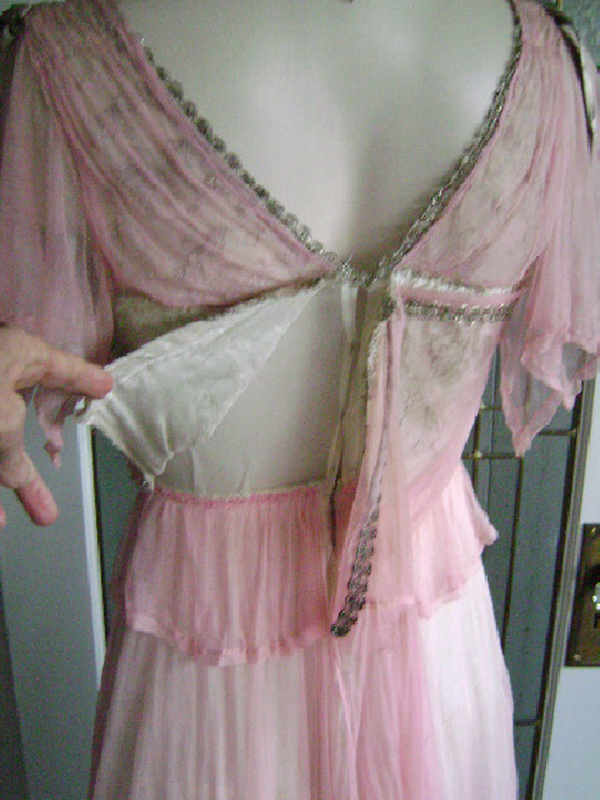 There is ornamental silver braid and silver ribbon adorning the bodice. The petersham inside the dress is the usual woven band at the waist. 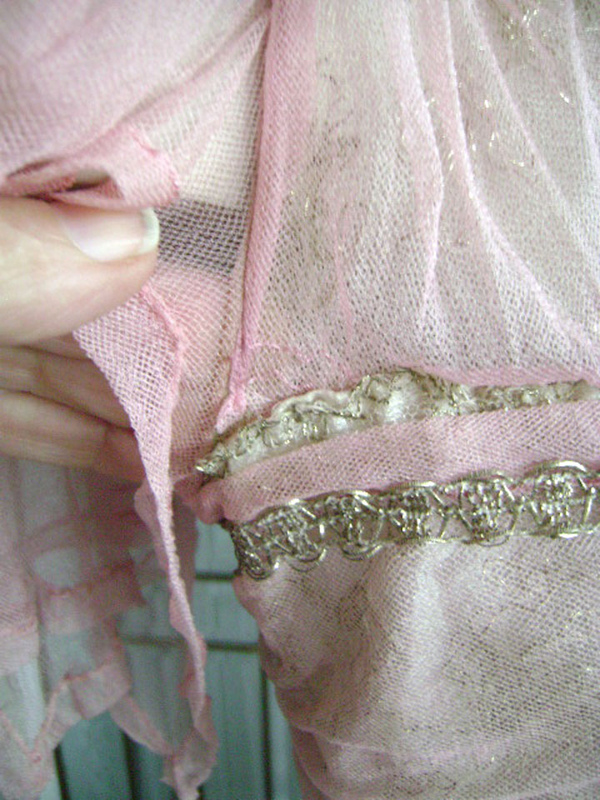 The outer finishing is a wide band of the pink gauze that shirrs from under the bodice, and wraps around twice, the second wrap narrowing to one side across the front. I have tried to show this is the last photos. All layers of the gown snap or hook separately, all sturdy and accounted for. The dress is spotless, I see no soil anywhere. 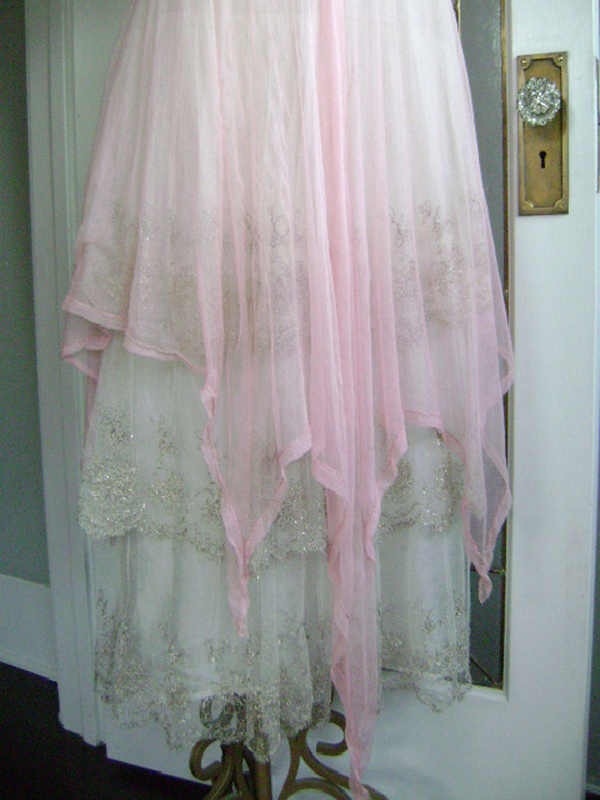 This is a gossamer dream of a gown, just a delight. 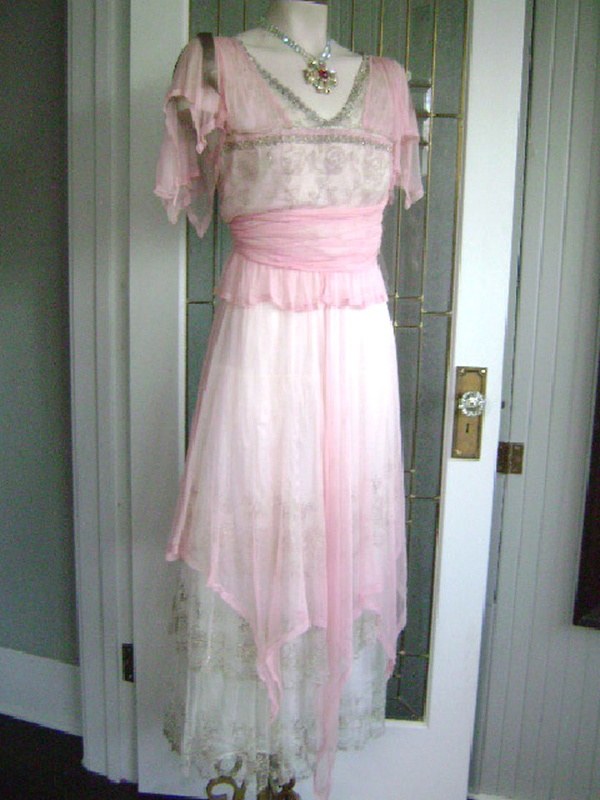 In spite of the delicate textiles this dress is strong being of rayon rather than silk, and could easily be worn for a wedding, which is something I usually don't recommend for 100 year old dresses. The gown needs no repairs to be worn. All is in order. There are some few tiny pinholes, fabric flaws, the bride breaks that net gets, but no large holes or tears, nothing that detracts from the dress or that you can see without laying the dress flat and searching for it. The dress is a rare beauty in wonderful condition. 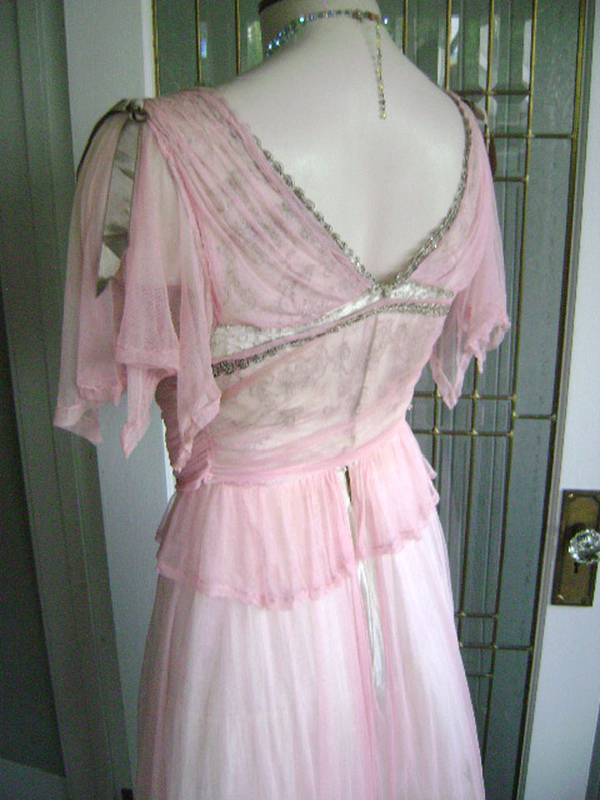 Very wearable, about a size 4 or so, it was perfect on my size 4 mannequin....Look to my store to see my other unique items. Measurements are fully expanded, the size of the dress, not the body they will fit. Allow for ease, dresses must have considerable drape to fit and hang properly. Only the waist can fit snugly. Any accessories not included in auction. Good luck bidding. Love this dress. So delicate and feminine. @Ladyghost4459 : Don't yo wish they still made gowns like this? So much more lovely than those short, tight little numbers that I see on the store racks!